Welcome to my new (and first) series… Slow Cooker Sunday. As the temperatures drop and the craziness of the holidays approach you may want something hearty and stress-free for dinner and the perfect solution to that is a slow-cooker dinner. You put all of your ingredients into the cooker in the morning, set it to cook on a high or low setting depending on your time needs and by the time you are ready to sit down to dinner your meal is ready and clean-up is a breeze. It can’t get better than that. A slow-cooker meal is also perfect for during the week, whether you are working, running errands or taking care of kids. That dreaded question that may run through your mind throughout the day – “what should I make for dinner?” – can easily be answered. So be sure to check back every Sunday to see what new meal I post. 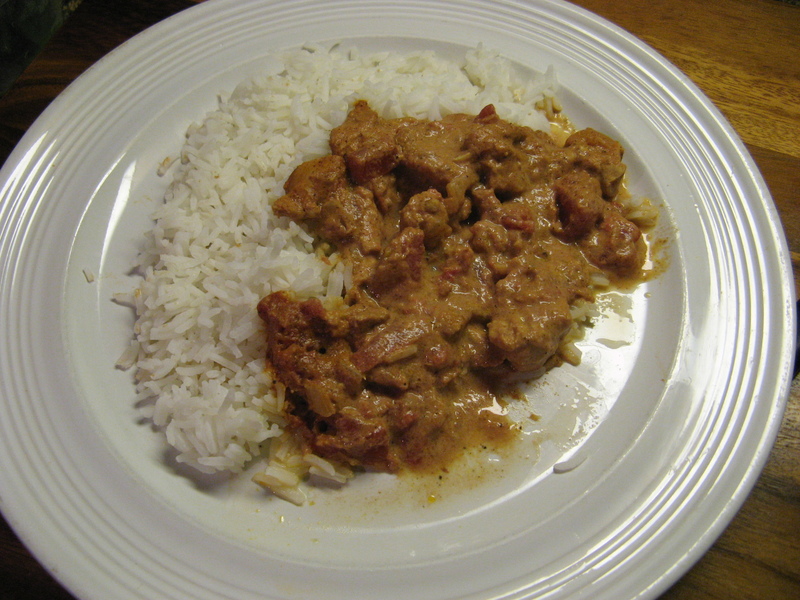 For today’s first Slow Cooker Sunday meal I am bringing you Chicken Tikka Masala. This is something I always order whenever I go out to an Indian restaurant. I am always tempted to order something different but I always settle on this favorite. 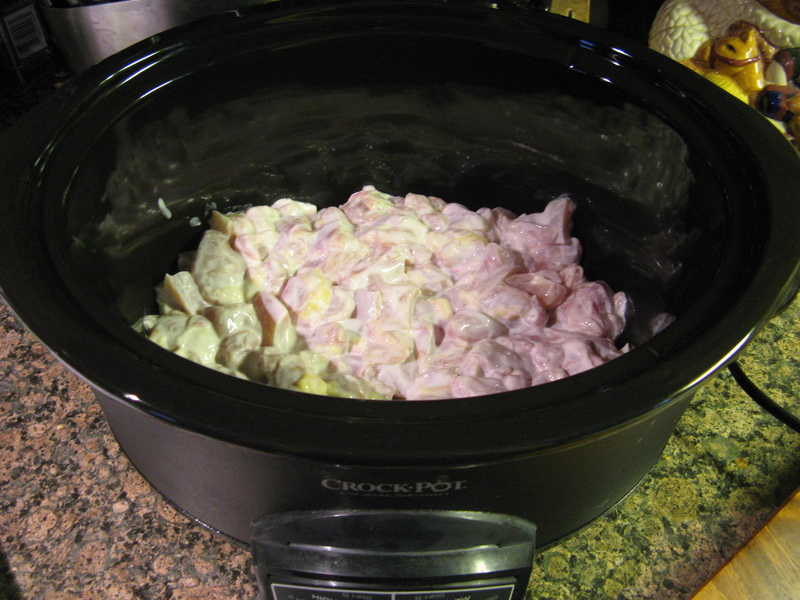 I began by cutting about a pound and a half of boneless skinless chicken thighs into bite-sized pieces and marinating them in yogurt for a few hours. Afterwards I placed them in the bottom of my slow cooker. In case you are wondering, marinating the chicken in yogurt helps to tenderize the chicken. Next, in a sauté pan I cooked a diced onion and three minced garlic cloves in olive oil until the onion was softened. I then stirred in fresh grated ginger, tomato paste, garam masala, paprika and Kosher salt. Garam masala is what gives this dish its incredible flavor. Typically it’s a blend of black and white peppercorns, cloves, cinnamon, nutmeg, mace, black and green cardamom, bay leaf and cumin. Initially I looked for it in the international aisle of my supermarket and with no luck there I checked out the spice area and was able to find it among the McCormick Gourmet spices. I should have known it would be among the “fancy” spices in the glass bottles… LOL! 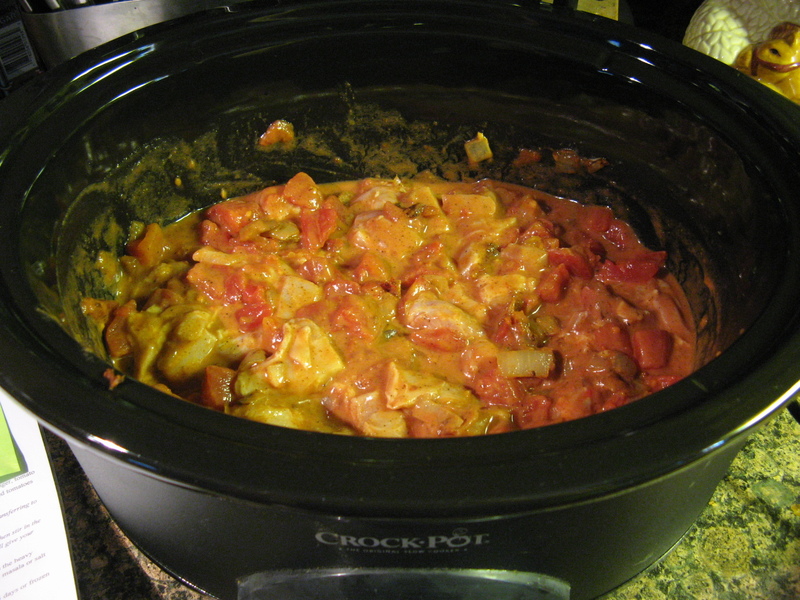 I then added the onion mixture to the chicken in the slow cooker along with a can of diced tomatoes. After stirring everything together I covered it and cooked it on high for 4 hours. I typically like to use my slow cooker on the low setting, but, I needed this dish to be done in the early afternoon. Which I served on the side with some of the chicken. This was INCREDIBLY delicious and just as good as the Chicken Tikka Masala I’ve had at some of my favorite Indian restaurants. I can’t wait to make it again. Marinate the chicken in the yogurt for up to six hours or as little as an hour. Shake to remove the excess yogurt and place in the bottom of the slow cooker. 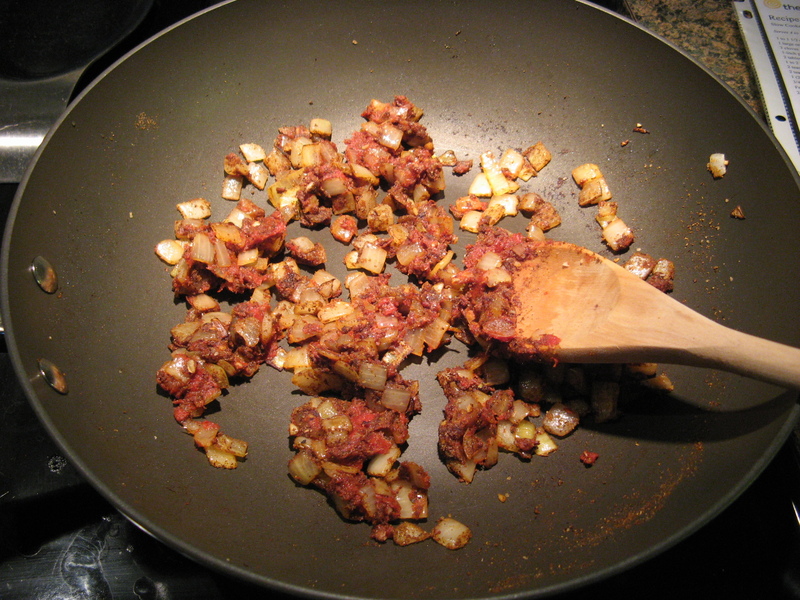 Sauté the onions and garlic in a little olive oil over medium-high heat until the onions have softened. Stir in the ginger, tomato paste, garam masala, paprika and salt. Transfer to the slow cooker on top of the kitchen. Add in the diced tomatoes. Stir to combine everything. 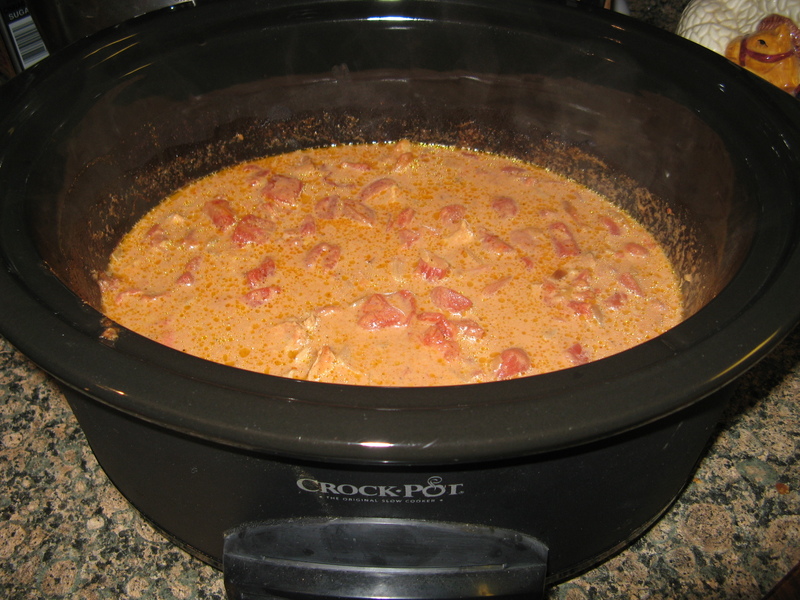 Cover the slow cooker and cook on high for 4 hours or on low for 8 hours. Make note of the start time because 15 minutes before the end of cooking add in the heavy cream. If you would like a thicker sauce leave the cover off for these final 15 minutes. Serve over rice. Thanks! It really is quite delish.